One of my favorite RESCAPEMENT articles is One-Watch Collection: The Best Everyday Watches 2018. I thought it’d be fun to do a slight variation of this article to start 2019: building a collection with a favorite watch of every complication type. I’m drawing from our RESCAPEMENT Guide to Complications, which goes in-depth on the most popular complications in the world of horology. I’ll skip some of the complications reserved for the upper echelons of haute horology (striking complications, that’s you). I’m focusing on new watches, mainly to avoid certain impassioned vintage arguments (best vintage chronograph: Daytona, Carrera, El Primero? idk!). I’m also focusing on watches that are at least moderately affordable. So, for example, a $15,000 Patek Phillipe Calatrava wasn’t really considered for the time-only category. Nor was that $20,000 Rolex Daytona with a months-long waitlist considered in the chrono category. The dollar limit is a bit subjective based on the complication (for example, I don’t expect to find a $2,000 world timer), but I tried to keep my picks in the realm of sanity. ﻿When Tudor released the Black Bay 58 at Baselworld 2018, it took the watch industry by storm (alongside the Black Bay GMT). A vintage-inspired dive watch in a 39mm case and an in-house 5204 chronometer-certified movement? Put me on the waitlist. Gear Patrol called it the watch of 2018, and I’d have to agree. The snowflake hand is iconic, the faux guilt markings well executed, and the $3,500 price tag fair. There’s one colorway for now, but expect Tudor to release more (as they’ve done with the larger , 41mm Black Bay) over the coming years. Runner up: Omega Railmaster collection. The Omega Railmaster is the often-forgotten sibling in the 1957 trilogy of watches released by Omega — Seamaster, Speedmaster, and Railmaster. That original Railmaster reference, Ref. CK 2914, was recently commemorated with the release of the 50th anniversary Railmaster, with features strikingly similar to the original reference. The rest of the Railmaster collection also offers great variety (I particularly love the blue jean dial). ﻿Date windows are a controversial proposition to begin with, but at their best, are a semi-useful complication that adds interest to a dial. It’s pretty difficult to choose just one Grand Seiko for this category. The finishing on all of their watches is superlative, with hands that could cut through a pork chop and dials that could hang in art galleries. Above is a picture of the classic SBGA211 “Snowflake” with Grand Seiko’s Spring Drive movement. But, Grand Seiko’s recently announced U.S. limited edition series — SBGA384G, 385G and 387G — are interesting options as well. The SBGA387G is the closest to the classic snowflake, with a stainless steel case and similar snowflake dial, though with a distinct blue tint. Runner up: Rolex’s unmistakable cyclops date is an obvious choice here, as is the Oris Big Crown Pointer Date, but for something slightly under the radar, try the Bremont Airco Mach 3 which has a small date aperture at 6 o’clock. Honestly, I prefer a date window at 6 o’clock, and the way this date window balances out the two-stick markers at 12 o’clock keeps the dial well balanced. Note: Many of the watches in our One-Watch Collection Guide are time-only or date timepieces. I know I said I’d keep this watch in the realm of sanity, but to me, a Rolex GMT is the Rolex. and if you can get the Pepsi GMT Master-II (Ref. 126710BLRO) with that Jubilee bracelet at its $9,250 MSRP, you do it. It’s a watch that never goes out of style and will likely be worth more in 20 years than it is today — not that you’d ever want to sell it anyway. It’s trading at slightly less than $20,000 on the secondary market today, but if you can get in the good graces of your local authorized dealer and snag one at a price lower than that… well buy a lottery ticket on your way home from the A.D.
Runner up: It’s hard not to pick the Tudor Black Bay GMT, but two Tudors in one list/collection seems excessive. So we’ll divert from the predictable and point to the Hamilton Jazzmaster GMT as a nice budget-GMT option. The black-dial version with a red GMT hand looks like a million bucks, but costs just $1,295. A World Timer for $6,100? Yes please. The Nomos Zurich World Timer is offered in a white dial (Ref. 805) or midnight blue dial (Ref. 807, above). The galvanized dark blue is a little more interesting to me, seeming to catch the light differently at every angle. Inside each reference is Nomos’ in-house calibre DUW 5201, an automatic movement that sits just 5.7mm high. The watch itself is just 39.9mm in diameter and 10.9mm thick, surprisingly slender for an automatic world timer. No one is taking quality engineering and clean design more seriously than Nomos, and the efficiency of its processes means its timepieces are always priced fairly. Runner up: Casio World Time. Sure, $6,100 is a killer price for a world timer. But how about $15, or about 63 cents per time zone? Or, try the “gold” version. Casio watches are all about having fun, and its world timer choices might be the most fun. The category we’ve been waiting for. With so many classic names, where do we go? There are classics like the Omega Speedmaster, TAG Heuer, Carrera, IWC Portugieser or Pilot’s Chronograph, not to mention budget picks like the Seiko Presage SRQ023 or Seagull 1963 Chronograph. As much as I wanted to pick the new TAG Heuer Carrera by Fragment Design, a watch which takes the best elements of the original Carrera 2447 and improves on them, it’s a limited edition watch that’s nearly sold out around the world. But, we’re going a little off the board here by featuring the Habring2 Doppel-Felix. It’s a split-secconds (“rattrapante”) movement from Austrian husband-and-wife team Maria and Richard Habring. The Doppel-Felix is an iteration of the in-house A11 that the Habrings developed for their Chrono-Felix, a chronograph they brought to market in 2014. That movement was originally based off an ETA 7750, though the Habrings have gone in-house since. In 2018 they really showed off their independent watch-making chops by unveiling the Doppel-Felix. Offering a split-seconds chronograph at €7,750 (no-date version) is a pretty impressive feat. 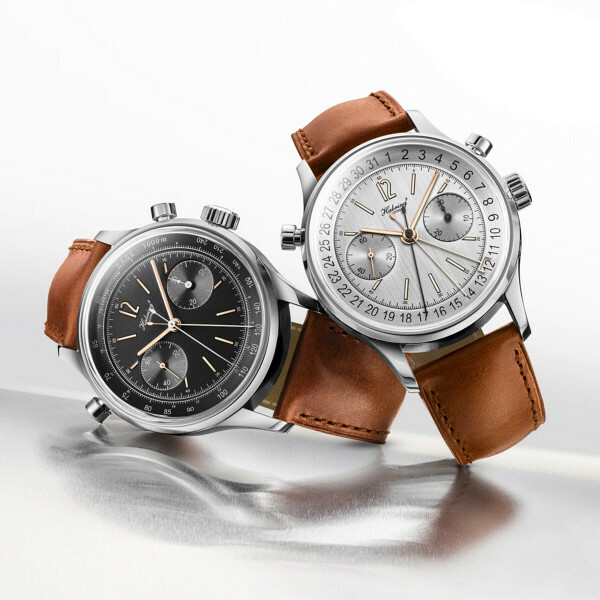 Every brand has its signature chronograph that it’s been selling for generations. But none are better than this little operation out of Austria, a testament to what happens when you put the time into research, development and true innovation (while others are stuck in the past). Runner up: Pick your favorite brand; everyone’s got a chronograph to offer. Seiko is offering something interesting with an enamel dial and chronograph at $2,400, while the other brands are relying on history and storytelling to try to sell you chronos that haven’t changed much for a generation or two. Frederique Constant’s collection of Slimline Moonphase watches provides an accessible line of dress watches that go above and beyond the simple time-only dressier look. The standard stainless steel model, above, goes for $3,695. It features a manufacture calibre FC-705 movement with moonphase and date hand sitting in the 42mm case. With the thin bezel and clean dial, the watch certainly wears bigger as well. The collection offers a number of other dial designs as well, all drawing on the minimalist aesthetic of this watch. Runner up: Like the Frederique Constant, the Orient Star Open Hear Moonphase is another affordable pick. For a more upscale moonphase, no one does dress watches quite like Jaegre Le-Coultre. The JLC Master Calendar comes in at just under $10,000, and is a classic dress watch that will last a lifetime. To me, the A Lange 1815 Annual Calendar is the perfect execution of the complication (or the Saxonia Annual Calendar, depending on if you’re a fan of A Lange’s big-date windows at 12 o’clock), but at $40,000 it better be pretty damn perfect. For a more reasonably-priced option, look to Montblanc. The brand — primarily known for its fountain pens and leather goods — has made real strides in watchmaking over the past few years. It’s invested heavily in research and development, and even acquired the rights to historic Swiss watch brand Minerva. One of its best releases was the 2016 release of the Heritage Chronométrie Chronograph Annual Calendar, which, as the name suggests, brings together two sought-after complications in one watch, at an incredible price of $9,700. I mean, look at all you get in that dial for less than $10,000: full hours and minutes, moonphase, running seconds, day, date and month, and a 30-minute and 12-hour chronograph counter. The watch quite literally does it all. Runner up: The annual calendar Rolex Sky-Dweller might be the flashiest Rolex on the market right now, but for the runner up we’re looking to another watch that combines two desirable complications, the annual calendar and the GMT. The Blancpain Villeret Quantieme Annuel GMT brings together these two complications by introducing a new calibre 6054F. The steel references come in at just under $30,000, while the precious metal references run as high as $58,000. And now for my endless fascination with the Ochs und Junior Perpetual Calendar. The independent Swiss brand is doing things like no one else. Its perpetual calendar movement uses an Ulysse Nardin UN-118 movement as the base, adding just nine additional parts to the movement. It’s a true feat of engineering, and you’d be lucky to get your hands on one considering they manufacture only about 15 perpetual calendars a year. Each one is made in collaboration with the purchaser, so it’s a chance for armchair horologists to get a little involved in the manufacturing process. They run about $30,000. Runner up: Of course, a Patek Phillipe Perpetual Calendar (ref. 5320) or Perpetual Calendar Chronograph (Ref. 5270P, because it has to be that salmon dial) are grail watches worthy of the high-six figure prices they command. Perpetual calendar offerings from other haute horology manufacturers like Vacheron Constantin and A. Lange are equally grail worthy. Frederique Constant and Baume & Mercier have interesting offerings in the sub-$20,000 price range, but I’ve been intrigued by the Glashutte Original Senator Excellence Perpetual Calendar line since the German brand released the collection at Baselworld 2017. It’s an updated take on the brand’s Senator Perpetual Calendar line with a more modern design aesthetic and an updated automatic movement.